For the traveler, the design of a hotel’s lobby is a predictor of the experience to come, so it’s no question why hotels are packing such a punch in their lobby design. The Langham Hotel in Chicago (above) is just stunning with its custom glass bauble installation art hanging in the lobby. The lobby is both sophisticated and whimsical, a combination that is one of my favorites! 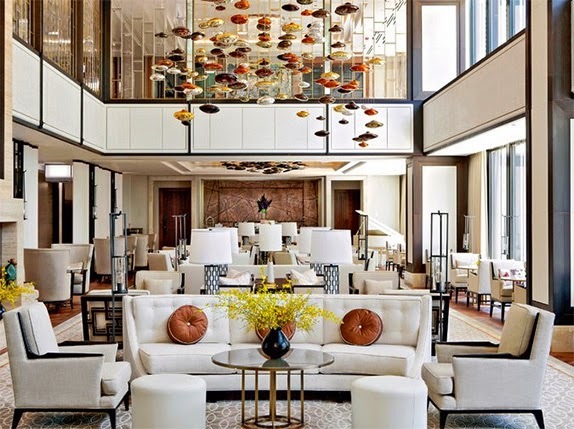 The choice of neutral and cream colored furnishings really allows the accessories to shine, while creating a relaxing environment for the Langham Hotel traveler. Skillful design indeed. 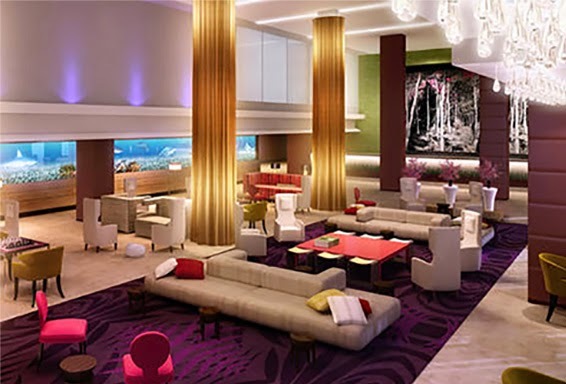 Take a look at their website and you’ll find that their rooms are just as stylish and upscale as the lobby. I’d certainly book an extended stay here. If you’re ever in Chicago, I should note that The Langham Hotel features hand-crafted cocktails and live music every Friday and Saturday night (8:30-12, but call first to confirm the schedule hasn’t changed – more info here). The city views are an added bonus! Richly dyed furnishings and the crystal lighting of the hotel above exude luxury. This lobby says to the style maven, “You are just where you belong.” What more could you want from a hotel? Well, perhaps a comfortable bed too, but something tells me that won’t be a problem here. 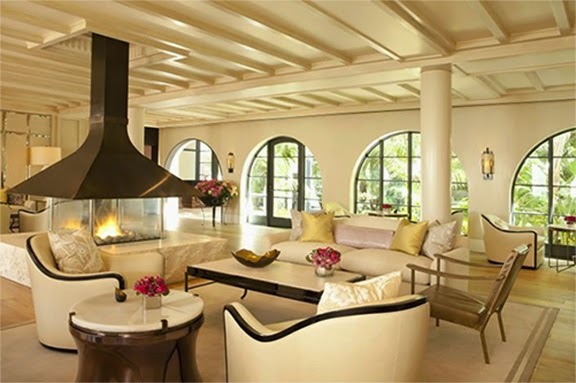 The Hotel Bel-Air is California casual-luxury at its best! I love the contrasting black accents on the armchairs and with the arrival of Fall’s crisp air, I especially appreciate the inclusion of a cozy fireplace. The arched french windows add to this hotel’s luxurious charm. This hotel also features a highly-recommended bar & restaurant with a menu crafted by Wolfgang Puck and nightly live music. Doesn’t this hotel space make you want to cozy-up and relax?– while dressed very stylishly of course. 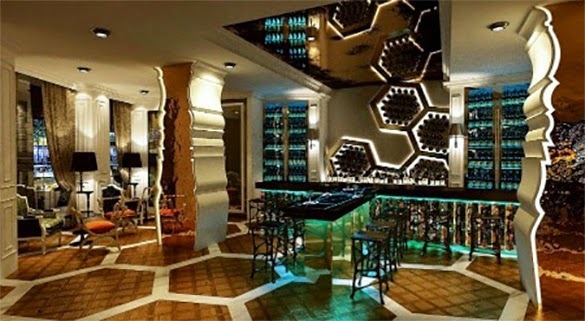 How unique are the hexagonal wine racks at the Singapore Sofitel’s lobby bar? 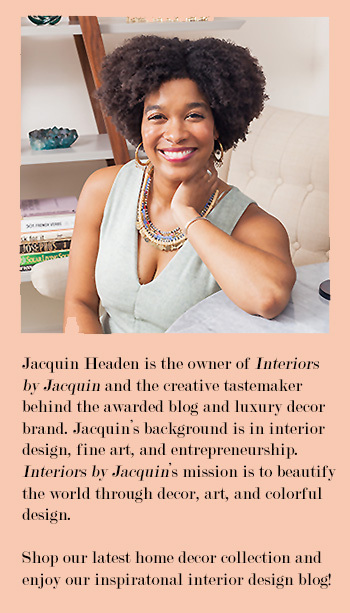 The designers achieve a contemporary and distinctly memorable look. This hotel is on my list of hotel designs I must see in person. Hopefully I’ll be sharing a photo with you of myself in this very lobby in the not too distant future. Fingers crossed! What features make a hotel most memorable to you?